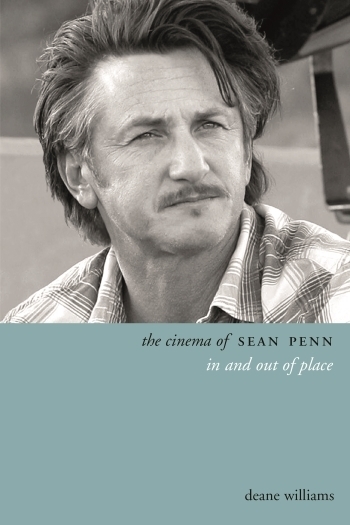 By my count The Cinema of Sean Penn: In and out of Place is Deane Williams’ sixth or seventh book publication, and when watching an academic’s oeuvre build it is interesting to guess at what continuities are apparent, what links exist across books, what preoccupations present themselves. Of course there need not be any connections, it’s equally plausible to have a series of new beginnings. But Williams’ book on Sean Penn displays some clear consistencies with his earlier writing. His expertise in documentary film criticism – Grierson, Australian documentary traditions, the documentary essay film – underpins sections of his detailed textual analyses of segments of those films of Penn’s which seem to Williams to draw on non-fictional works, or at least bear productive comparison with them. Equally, in focussing on Penn’s films as director, and alluding to many of Penn’s most famous acting roles, we see the side of Williams that co-writes a book with Brian McFarlane on the cinema of Michael Winterbottom. One consistent critical disposition on display in this book is Williams’s love for, and detailed knowledge of, music. The relation between music and mise en scène becomes a strong part of his analyses of Penn’s films, as it must when we learn that Penn composes film sequences with deliberate gaps in them, gaps that music will complete at the editing stage. Penn says that this textual feature of his filmmaking is his response to the way music was used in some New Hollywood films he admired, such as The Graduate (1967) and Harold and Maude (1971). And we could add, McCabe and Mrs Miller (1971). For his use of the concept of intertextuality Williams draws on Mikhail Iampolski’s The Memory of Tiresias and specifically his observation that “the quote is a fragment of the text that violates its linear development and derives the motivation that integrates it into the text from outside the text itself.” (5) In his book Genre, John Frow has an excellent definition of intertextuality: “The elaboration of a text in relation to other texts. The radical import of the concept in contemporary criticism has to do with its implication that rather than being self-contained and self-present structures, texts are traces and tracings of otherness, shaped by the repetition and transformation of other texts.” (138) And Francis Mulhern in his recent book Figures of Catastrophe: The Condition of Culture Novel – in which he refers favourably to Frow’s book – has a helpful description of what is involved in working with the term “genre” when he describes genres as “always already formed or in formation, genres are trans-textual, inscribed across texts, sometimes shaping them decisively, at other times inflecting them, contributing to more complex outcomes,” and adds that they are “historically formed ways of seeing” (6). The Frow-Mulhern quotations indicate how genre and intertextuality can become mutually supporting critical concepts, and in investigating Penn’s films, Williams selects the “social problem” film as a genre whose legacy is apparent, noting that the fact that Penn’s father acted in some Hollywood independent examples of this kind of film (Ida Lupino’s Not Wanted) might go a long way to explaining the persistence of this felt generic presence in the son’s directorial career. The Cinema of Sean Penn carefully traces all kinds of music-image relations across the bodies of these film texts, thereby indicating in one instance how each film is a “network of quotations,” (5) comprising an “intertextual network.” (126) This is even more prominently the case with any act of casting – be it Jack Nicholson, Harry Dean Stanton, Sam Shepard, Mickey Rourke, Ernest Borgnine. On each occasion the place-space-character linkage inhabits the film-textual historicity of the actor in question, and Williams shows how alert Penn is to this fact when directing. One especially admirable aspect of Williams’ book is the way that it allows the reader to see its author following various lateral leads contained in the aesthetic objects he is encountering. By dint of his research, certain bits of empirical information come Williams’s way and he dutifully pursues their significance. This might take him to European crime fiction, European art cinema, the cult US writing of Harry Crews and Charles Bukowski, or the writing of the Beats. We see Williams watching, listening, reading, as he follows these leads, as opposed to a different kind of criticism which brings with it an already-made interpretative steamroller of whatever persuasion and places it in connection with an oeuvre of some kind. When discussing Seattle grunge, Eddie Vedder, and Pearl Jam in relation to Penn’s filming of Into the Wild (2007), or the place of Bruce Springsteen’s music in relation to The Indian Runner (1991)(derived from Bruce Springsteen’s song, “Highway Patrolman”, on his Nebraska album) we have a clear sense that Williams already was on the same page with Penn. With its setting overlapping with the historical moment of The Chicago Convention in 1968, The Indian Runner also invites placement alongside such other texts as Norman Mailer’s celebrated 1968 “faction,” The Armies of the Night, and Haskell Wexler’s 1969 film, Medium Cool, each merging documentary and fiction. So, once again, other traces of New Hollywood could follow Williams’ critical pursuit of the films Penn has directed. The role of intertextuality reappears when Williams’s analysis of The Indian Runner links certain periods in Springsteen’s musical career to iconic American films: Thunder Road in one instance, The Grapes of Wrath linked to The Ghost of Tom Joad album in another instance. But on other occasions we infer that aspects of Penn’s films have obliged Williams to undertake some literary skip-traces to learn more about Penn’s allusions. Then again, when we learn of Springsteen’s liking for John Huston’s adaptation of Flannery O’Connor’s Wise Blood, Williams could mention that that film is also a favourite of Australian musician Nick Cave, who introduced a screening of it in Sydney in the early 1990s. It’s a sign of a book that has worked out excellent forms of conceptual capture of its visual-sonic targets if the perceptions and insights it puts forward hold good for texts related to its topic but not mentioned within its analysis. So when Williams discusses Bukowski by way of Penn’s keenness to act in Barfly (1987) – the role that went to the great Mickey Rourke and allowed him to talk like Mr Magoo for an entire film – we can add that late in life Bukowski made a belated acknowledgement of the influence of John Fante’s writing on his work. Fante and Bukowski both came out in beautiful editions from Black Sparrow Press, and Robert Towne, screenwriter-director and one of the main personalities in the New Hollywood, in 2006 directed his version of Fante’s 1939 novel, Ask the Dust. In this way Williams’s point about the influence of some New Hollywood texts on Penn’s directing carries through to these other “shadow” texts. The film The Gunman (2015) that recently starred Penn comes from the English translation of a Jean-Patrick Manchette noir novel The Prone Gunman (the same English translator also translated Manchette’s Three to Go) and these translations were published initially by City Lights Press, the bookshop and press a few hundred yards up a slight rise from a former iteration of Francis Coppola’s Zoetrope Studios, now a restaurant that also sells Coppola’s wines but which once was where Coppola and Wim Wenders worked on Hammett (1982). So quite literally a short geographical distance separates Beat writing, New Hollywood, and European cinema, the overlaps of which Williams is discussing. When an allusion is made to Malick’s Badlands (1973) (33) the discussion detours Williams into the short, murderous life of Charles Starkweather, and as it happens Christian Patterson has a photographic book called Red-Headed Peckerwood in which he meticulously traces Starkweather’s short killing spree, finding and photographing some items of Starkweather’s that went unnoticed by forensic investigators at the time. Luc Sante writes the introduction to Patterson’s book, presumably on the basis of his having written his crime-scene photography book, Evidence, a book that has influenced the research done on Australian crime scene photographs by Peter Doyle and Ross Gibson. Inevitably Williams’ book must engage with the HUAC period of American history and its impact on Hollywood and on Penn’s parents who were directly affected by it. (6; 10-13) It is an area of film historical scholarship that continues to generate new and welcome analyses, and it also has generated a substantial number of documentaries and fiction films addressing the topic: Hollywood on Trial (1976),Trumbo (2015), Red Hollywood(1996) are all estimable documentaries and The Way we Were (1973), The Front (1976), Guilty by Suspicion (1991), Fellow Traveller (1990), Goodnight and Good Luck (2005) and Trumbo all address this historical moment from a later Hollywood perspective. When Elia Kazan, one of those who “named names”, was given his Lifetime Achievement Award – the presentation overseen by Robert De Niro and Martin Scorsese (each of whom had roles in Guilty by Suspicion) – cutaway shots showed Sean Penn and Nick Nolte sitting on their hands, refusing to clap, whereas Warren Beatty stood and clapped (Kazan had directed Beatty in his early role in the great melodrama, Splendor in the Grass (1961)). So the history of this ugly period in American history can still be felt in contemporary Hollywood. Williams draws on some writing from Richard Rorty as a way of engaging with the cultural-philosophical tradition of Dewey and American pragmatism. Rorty began as a brilliant analytic philosopher but later deviated sufficiently from that circumscription to be called a “Professor of Humanities” at Stanford University and the University of Virginia. Williams’s reading of Into the Wild causes him to follow some literary-philosophical paths laid down by the 19th century American Transcendentalists such as Emerson and Thoreau. Williams uses this perspective to characterise Penn’s directorial work as “hopeful and communitarian, yet tragic and critical.” (7) Tony Tanner’s great book from the mid-1960s, The Reign of Wonder, offers a very helpful exploration of the influence of American Transcendentalists on 19thcentury and 20th century American fiction. It is worth remarking that certain aspects of the “Sean Penn persona” go unremarked in this study. I remember reading an interview with Penn in which he was asked whether he would be acting again soon, and he replied that after seeing what ghastly psychic spaces Jack Nicholson had to go into to create his character in The Crossing Guard (1995), it would take a lot of money to get him back on that side of the camera. Of course he duly did and won two Academy Awards. In 2004 when Penn won his first Academy Award for Best Actor (in Mystic River ), he used his acceptance speech to say that all actors know there is no such thing as “the best actor” just as everyone knew there were no “weapons of mass destruction” in Iraq. So far, so good. He concluded by thanking Robin Penn-Wright for her “undying emotional inspiration,” and within a month or so of this Oscar telecast, they had separated. Friendship and collegiality underpin the writing of this book. Williams dedicates his study to his Monash University film studies colleague, Con Verevis, for having planted a creative seed in his mind by saying he had just seen Todd Field’s In the Bedroom (2001) and thought of it as “like a Sean Penn film” for the way it depicted a “confined and character defining sense of place.” (vii) As anyone currently working in the Australian tertiary education sector well knows, it is quite difficult to find time to develop research topics, complete them, have them published by an acceptable-to-one’s-University press, while also teaching undergraduates and supervising postgraduates, performing administrative work as required, being besieged by all manner of inane compliance insistence forms, and maintaining a personal–family life. The fact that Deane Williams has published his book with a respected international (UK/US) publisher testifies not only to his own capacities for organised, efficient, scholarly work but also suggests that the book carries a resonance of research successfully completed in a harmonious workplace – as the dedication to Con Verevis and the thanking of many other colleagues implies – such that collegiality and excellent film criticism, in this place, co-exist. John Frow, Genre: The New Critical Idiom (London and New York: Routledge, 2005): 138. David Walsh, A Bone of Fact (Sydney: Picador/Pan Macmillan, 2014). I owe this anecdote to Amanda Lohrey who has written twice on Walsh in ways that provide helpful insights into his somewhat opaque persona.